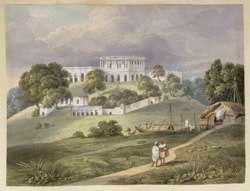 Water-colour drawing of the Hill House at Bhagalpur by Sir Charles D'Oyly (1781-1845), September 1820. This is one of 28 water-colours by Charles D'Oyly of a trip along the Bhagirathi and Ganges Rivers, dated August to October 1820. The trip must have been to take up his new appointment as Opium Agent at Patna as a letter to Mrs. Jean Macnabb (Mss Eur F206/19) shows him established at Hajipur opposite Patna by 8th December 1820. Bhagalpur, situated on the River Ganges in Bihar is the chief town and headquarters of Bhagalpur district. Augustus Cleveland (1755-84) of the Bengal Civil Service was Collector and Judge at Bhagalpur. He organized the Bhagalpur Hill Rangers, an auxiliary force which pacified the Paharia, or hill people, of the Santal Parganahs in the 1780s. Cleveland died at sea on a recuperative voyage to the Cape and his remains were returned to Calcutta for burial in Park Street Cemetery. Two memorials were erected to him in Bhagalpur, one in stone sent by the Court of Directors from England, the other, almost a shrine, built by his native staff and acquaintances. Dr. John Glas (b.1750) served as a surgeon on board a number of East Indiamen until 1778. Appointed Assistant Surgeon in 1781 he gave up promotion to remain at Bhagalpur, where he died in August 1822.